Includes tab and informational booklet. Mike teaches each of Maybelle's styles, along with appropriate songs: thumb lead (Wildwood Flower and Jimmie Brown the Newsboy), country blues style (The Cannonball), Hawaiian style (Little Darling Pal of Mine), and flat-pick style (You Are My Flower). Also included are Sara Carter's back-up style (Pretty Polly) and A.P. Carter's guitar style (I Never Will Marry). 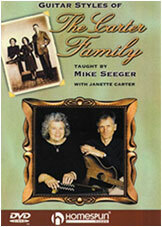 Janette Carter offers reminiscences of the family, demonstrates her mother Sara's guitar playing, and sings on most of the songs.